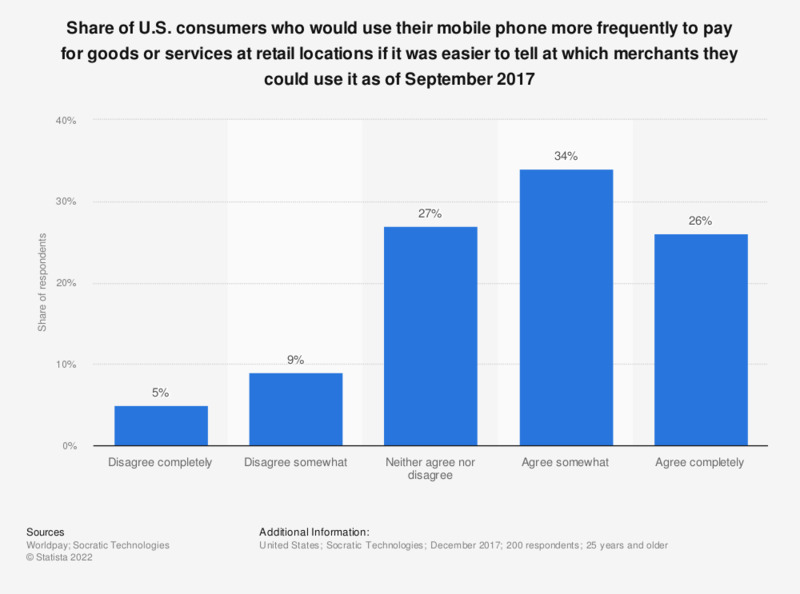 This statistic presents share of U.S. consumers who would use their mobile phone more frequently to pay for goods or services at retail locations if it was easier to tell at which merchants they could use it. During the December 2017 survey, 34 percent of respondents agreed somewhat with this statement. Original question: How much do you agree or disagree with each of the following statements about different ways to pay for purchases? I would use my mobile phone more frequently to pay for goods or services at retail locations if it was easier to tell at which merchants I can use it. Everything On "Mobile commerce in the United States" in One Document: Edited and Divided into Handy Chapters. Including Detailed References. In which of the following scenarios do you find it beneficial to pay by using your mobile? How often do you use your mobile phone to make an in-store payment?